Kim is a PMA ®-CPT trained through Polestar Pilates Education by Brent Anderson, PhD and Cynthia McGhee, PT. Since 2000, Kim has maintained a private Pilates practice working collaboratively with her husband, Bob Turner, PT, DPT, OCS, MS, OM, LAc. 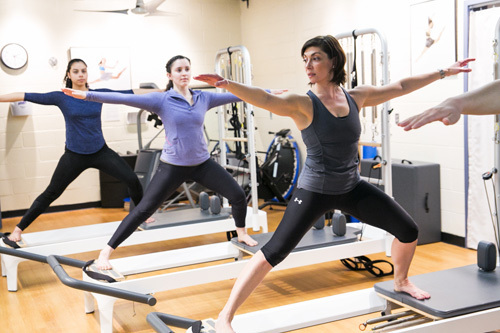 MOVEMENT CoLab’s approach to Pilates, is the culmination of many years of their collaborative work, which blends their respective areas of expertise in movement and rehabilitation through a creative lens for each individual client. Kim has a special interest in labral pathologies of the hip, spine health and foot/ankle pre and post rehabilitation. Her approach to neuromuscular re-education is focused on delivering clients back to their fullest movement potentials with pain-free, lasting results.